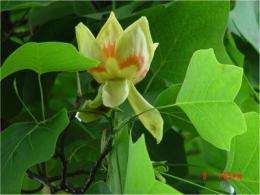 (PhysOrg.com) -- The evolution and diversification of the more than 300,000 living species of flowering plants may have been "jump started" much earlier than previously calculated, a new study indicates. According to Claude dePamphilis, a professor of biology at Penn State University and the lead author of the study, which includes scientists at six universities, two major upheavals in the plant genome occurred hundreds of millions of years ago -- nearly 200 million years earlier than the events that other research groups had described. The research also indicates that these upheavals produced thousands of new genes that may have helped drive the evolutionary explosion that led to the rich diversity of present-day flowering plants. 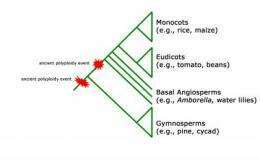 The study, which provides a wealth of new genetic data and a more precise evolutionary time scale, is expected to change the way biologists view the family trees of plants in general and flowering plants in particular. The research findings will be posted on the early-online website of the journal Nature on 10 April 2011, and later will be published in the journal. "We began with some intense genomic detective work -- combing through nine previously sequenced plant genomes, plus millions of new gene sequences that the Ancestral Angiosperm Genome Project (http://ancangio.uga.edu/) had gathered from the earliest surviving lineages of flowering plants," dePamphilis said. "We knew that, at some point in ancient history, one or more important genetic metamorphoses had occurred in the ancestor of flowering plants, and we also knew that these metamorphoses could explain the enormous success of so many species living on the Earth today. Most importantly, we suspected that these important changes had been driven by a common mechanism instead of by many independent events." DePamphilis explained that, after examining volumes of molecular evidence, his team discovered and calculated the dates for two instances of a special kind of DNA mutation -- called a polyploidy event -- that revolutionized the flowering-plant lineage. 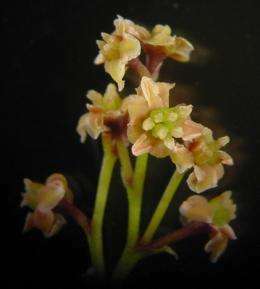 DePamphilis also said that, thanks to the two polyploidy events that his research team identified, flowering plants may have enjoyed a distinct evolutionary advantage that allowed them to survive harsh climate changes and even mass extinctions. One such extinction that was accompanied by more-recent polyploidy events in several flowering-plant groups was the CretaceousTertiary extinction event (the K-T event) -- a mass extinction of animals and plants that occurred approximately 65.5 million years ago that may have been triggered by a massive asteroid impact. Argentne geologist and paleontologist Dr. Jorge Calvo proved that huge argentine titanosaurs ate flowers...he proved this years ago.